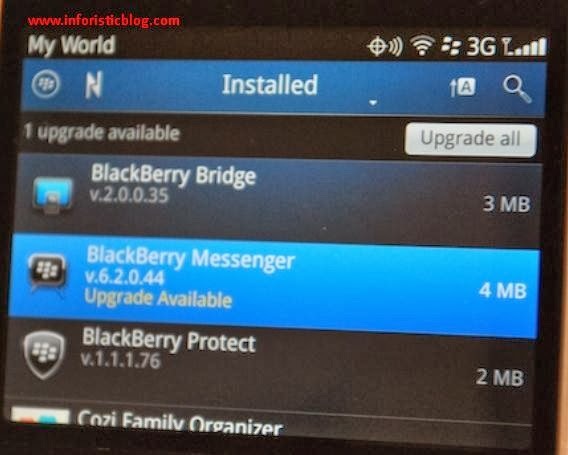 Ever since the latest version of BBM (BBM 8.0) was released, a lot of people using some kind of lower blackberry versions have been having issues with hanging and slow loading on the new BBM, Downgrading to a lower version has also been impossible but here's how you can delete and install lower versions of BBM on your Blackberry and say bye-bye to the slow loading and frustrating hangs. 1. Before you can do the downgrade, you will need to delete the current one by going to MENU >> Options >> Device >> Application Management then Locate the BBM app and delete it. 2. After successful delete, allow the phone to reboot. 3. Using your default blackberry browser, click on any of the links below depending on the OS version of your Blackberry device and install accordingly. Got any question or observation? Use the comment box below, i will be glad to help. NB: You won't miss out on our future updates if you subscribe with your email address, follow us on twitter or like our facebook page. Let's have your views and opinions on the post; How To Install Earlier versions of BBM Instead Of BBM 8.0 , use the comment box below this page and share this post as well.